The apps, coupled with the myWholeLife.ca website offer accessible, professional nutritional advice at a fraction of the cost of one-on-one consultations. To the 9 million in Canada and over 28.5 million people in the United States diagnosed with diabetes or pre-diabetes, the app provides a unique, personal platform for information to help prevent and manage complications from the disease. Taking an integrative, holistic approach, Blood Sugar acts as a diet and lifestyle toolkit that helps users maintain an optimum blood level balance by creating a nutritional guide backed by leading-edge science. 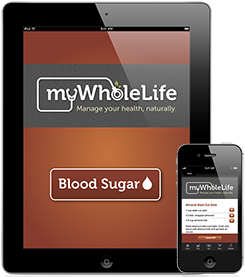 Featuring top foods, supplements, and realistic suggestions that can be easily implemented into everyday life, Blood Sugar helps to bridge the gap between Western and holistic medicine, delivering a personal holistic nutritionist to your fingertips. With the purchase of the app you receive a 7-day meal plan, 21 recipes and snacks that incorporate simple, everyday whole food ingredients presented in the nutritional guide. The easy to use interface also offers the option to create, save and print a customized shopping list based on recommended Top Foods, supplements, and ingredients from the week’s meal plan. The App also offers “Healthy Swap” suggestions such as replacing refined wheat products with whole grain varieties for simple changes that easily fit into users’ lifestyles. With individuals living with diabetes incurring medical costs between $1000 and $15 000 each year, using the Blood Sugar App, especially as a preventative measure, can help users to mitigate both future direct and indirect health care costs. The app will be available for $2.99 at the Apple App store.